Can anyone clear up the fitness feature: does the new Nano software completely replace all the functions of the Nike+ sensor? Is there now absolutely no advantage to using the latter? And does last year's clip-on iPod Nano also get this new Nike+ feature or is there new HW in the new model to make it work? It's out now and I have it installed on my 16GB 6th gen. It's pretty sweet. I love the new clock faces. It does in fact have the Nike+ feature and has had it for at least 2 generations. According to the website, an accelerometer is now built in. The nano has had an accelerometer since at least gen 4. A report from the teardown experts at iFixit shows […] an identical internal build when compared to the previous generation, with most components carried over from last year. And you have Nike+ built into your 6th gen Nano simply from the firmware update? The app was on there in the old version. I haven't seen any improvements or differences between the 1.0 and 1.2 update. To my knowledge, the dongle sensor is for much more precise measurements than just the accelerometer; while the app remains the same. You still have to buy the shoe. Forgive me if I'm wrong, but it won't work with out it. I may have been built in for a while, (i'll check the code when i'm done studying). Sol, are you o.k. today? Yes. Last gen has Nike+ built in. Can anyone recommend a watchband for this? I think this is a very cool product now with the update- esp its pricing. Schiller seemed to really light up when presenting it. A pure fun device with lots of music for the gym-I'm looking to upgrade my 3G shuffle with this. iLounge has upped their rating for it too. Really? You can't even use the nano at the gym anymore. If you want it as a watch, go ahead. So you want a woman to show you to (probably a plastic) band that you will put your iPod on that takes ten minutes to get to a song. O.K. Would you buy your women a plastic engagement ring? I still like the last, last iPod... with the click wheel and the screen so I know what I'm doing. In the old version, the pedometer app worked without the Nike+ shoe transmitter, but to get the full features of Nike+, you needed not only the transmitter, but the receiver as well. So if you still need the shoe fob then it means they added the proprietary wireless tech built off of 802.11 to the new Nano. That, the new SW, and a price drop sound pretty good but not good enough for me to give up using Nike+GPS on my iPhone. I love that app! If you want to remove your Nano often and use it without the watch band, I would recommend the TikTok, from the same site. Yea, I hear ya. The receiver is in the shoe. I've tried to buy several different brands and I have to admit that the salesmen have always been very honest with me. Thanks for being rather evasive with your post. Wow these new Nanos truly are remarkable devices. Imma buy one now I think. Yes! Very remarkable. Let me know if you want a 'run down' compared to last years model. AI's writing makes it sound like it's not a new HW feature? Yes, we've been running along to the "oldies" so to speak, for a while now. No, it's the pill-shaped transmitter that you put in the shoe. It's not "in" the shoe when you buy the shoe, and you can actually buy a shoelace adapter for any shoe, not just Nike. 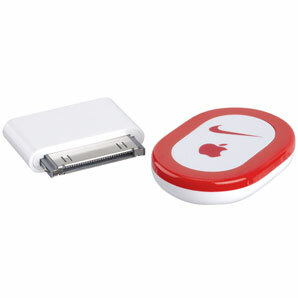 The receiver connects to the dock connector on the Nano and the Classic, and is built-in on the iPod Touch and iPhone. My question was whether the new Nano can provide all of the Nike+ functions as the transmitter/receiver combo. I still haven't got an answer. Receiver on the left, Transmitter on the right. The receiver is built in to the iPod Touch 3rd and 4th gen, and the iPhone 3GS and iPhone 4/4S. Shoelace adapter for non Nike+ shoes.